Ever wonder how to organize photos? Do you look at your collection of pictures and not know where to begin? 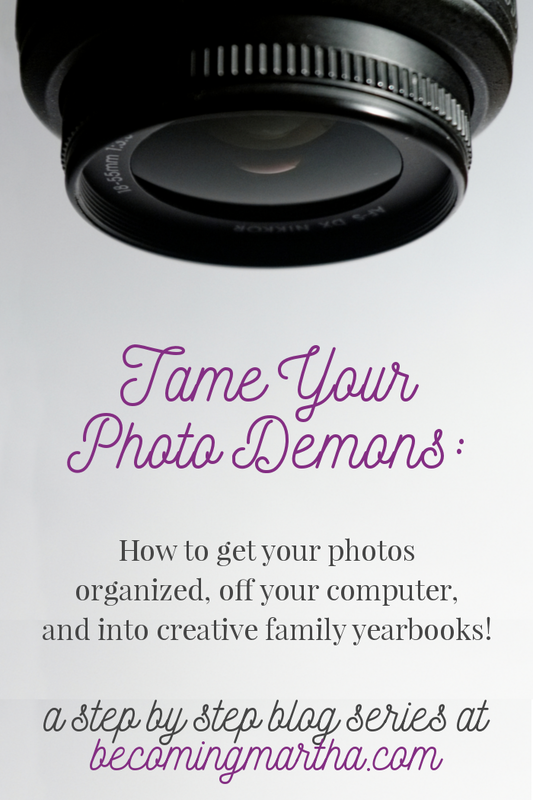 This post will share how to organize photos, and how to create beautiful family albums without the stress! A while back, I wrote a post on 10 Creative Photobook Ideas. I shared a picture of the family yearbook that I created for every year, and I received a lot of comments and emails, asking how I created them. A lot of people were wondering how to start mostly. Others wondered about the process I used to create mine, since I always say how easily achievable the results are. I decided to write this blog series that will walk you through the entire process, start to finish, and break down every step. Let’s get our photos off our digital devices and into our homes and hands, shall we? The first session in this series is the most important. Gathering ALL of your photos in one spot is what will make all of the other steps a piece of pie. Transferring photos from one media to another may take some time, so it is the most time intensive. It’s not difficult, it just takes some time. Once you find all of your photos, transfer them to one spot. Your computer or a portable hard drive would make the most sense. Within each yearly folder, I create 12 sub folders, one for each month. I name them 01 January, 02 February, 03 March, etc, so that they stay in chronological order (instead of alphabetical). Once all of my folders and sub-folders are set up, it’s time to start dragging and dropping photos into their proper home. This may seem like a big task, but thanks to the wonder of technology, there are a few tricks you can do that will make it easier. First, right click on the folder that is currently containing all of your photos and choose Sort By –> Date. You can choose Ascending or Descending, because either will work. It will place your photos in an order that will make it easier to move chunks. Second, to find the date of a photo, try this: hover your mouse over the image, and a little description will pop up containing some file information. In this little pop up, there will be a date. That is the date the photo was taken (provided your camera, phone, etc. is set to the correct date when the photo was taken). Third, occasionally the file will not have a date in the info box that pops up. This often happens with videos. You can usually find out the date the file was created though, by right clicking on the photo or video and choosing properties. A box will pop up with more detailed information, and at the bottom of this will be three dates. The middle date (modified) is usually the date the photo was made – the created date is when the file on your computer was made, not the actual photo. One exception that I have noticed to this however is when files are downloaded from iCloud. The date will represent the date the file was downloaded onto your computer, and not the date it was taken. I haven’t transferred files with DropBox, so I’m not certain if this is the case with DropBox as well, but just a heads up if you are transferring files with iCloud. Once you have your photos organized, it’s important to back them up. I backup my photos to a portable hard drive (in the organized format) and burn them to a archival quality DVD, which I glue into the back of the photo book once it is printed. Then I delete the photos off my computer so it isn’t bogged down. This system is easy to maintain going forward. I usually repeat this process every two to three months with the photos I have taken for those three months, and that way it doesn’t build up. Transfer, organize, back up (x2), and delete from my computer. If you take way more photos than I do, you may want to pick a day every month to do it. Pick the first or the last, or something like that to make it simple to remember. And that’s the biggest and most important step to creating beautiful family yearbooks! Next week, I’ll be back again with the next step in the tutorial: creating the visual layout for your book. If you want to get ahead for next week, download the Project Life app on your mobile device! I can’t wait to help you get your photos off your tech and into your hands! See you next week! So curious – how did you get transfer all your photos to your computer. Were they all digital to start with? I have MANY that are already printed, but no digital version – any recommendations? Most of my photos are digital – I bought a digitl camera when my daughter was 6 months old, so ever since then, everything has been digital. However, we wanted to create a family album recently with photos from our childhood, and we actually digitized all of them. It is a bit of an investment, but I am glad to know that myself and my siblings all have digital copies of those photos should anything happen to the original. There are few options for digitizing – the first being scanning them yourself, which is a lot of work! We went with the second option, which was to have a professional do them for us. We used http://www.getitdonephotosolutions.com/, which is local to us, but I am sure there are professionals around who do it. I split the cost with siblings, but even then, as I mentioned, it is a bit of an investment. Staples also does this sort of thing, and maybe Costco, and they charge by the hour. Depending on the amount of photos you have, you would have to determine if a per photo or per hour rate is best for you (we went with a per photo rate, and we had about 2500 pictures). Always ask them how they give your photos to you (ie… usb stick, archival quality dvd rom, etc) and also ask about insurance while they have your photos in their possession. DPI is also important – I think ours were scanned at 600 DPI. I hope that helps and if you have any other questions, I’d be more than happy to try to help! I guess I’m not far off the mark because this is exactly the way I organized my digital photo’s from the time my daughter was born (1997) because it just made the most sense. Then the computer crashed. Thankfully I had 3.5 floppy backups (remember those little discs?). I now have prints of every photo I could retrieve AND backups on Amazon cloud. The prints I organized in 3-ring binders with photosafe refill photo pages and put in a large d-ring 3-ring binder for ease in locating as I worked on scrapbooking pages (I go digital for these too). I have 4 five inch 3-ring binders with each binder separated by year/month with simple school-type binder dividers between years/months. I scanned school photo’s to place in the appropriate year/month as well. The only issue is the larger’landscape view’ photo’s which can be cropped after scanning. The 3-ring binders I store on the top shelf of my closet for safekeeping and in case we need to leave urgently due to fire/earthquake. Yes, it’s a time consuming task, especially the ‘hard copies’ that need to be scanned, but well worth the preservation effort. I still have a family photo of my great-grandparents 60th wedding anniversary and I have saved that as well in the same manner. 35 mm pics can be converted to print with snapfish or other digital services for mere pennies. I highly recommend Snapfish -good quality photo’s for minimal cost. You even get the 35mm slide back unharmed!